True reorganizations are rarer than ever and harder to find. So when I see the process work, it still feels good and gives me hope. I have a client that is a fairly substantial supplier and trade creditor of Mattress Firm, so I was involved in the Mattress Firm bankruptcy case only in a very peripheral way. Having said that, I attended the majority of the hearings and watched the progression of the case, mostly from an observer’s perspective. Sidley Austin LLP was lead counsel for the Debtor, and Young Conway Stargatt & Taylor was the Debtor’s local counsel. There were a number of other parties involved--including but not limited to those representing the Debtor’s secured creditors; the parent company’s secured creditor; and the parent company, and its landlords. To give you some insight into the complexity of the case, in each of the three hearings there were more than 50 professionals attending either in person or by phone, as well as a tragic event that occurred during the case, which I will touch on later in this article. The case was filed in Wilmington, DE, with Judge Christopher S. Soncthi presiding. Certainly, when a case is projected to pay most if not all constituencies close to 100 cents on the dollar there is great incentive for the parties to work well together. But even acknowledging that, it still struck me from a multitude of levels how well the Mattress Firm case was planned and managed. Mattress Firm has thousands of stores, which was part of their issue; they had recently made an acquisition of Sleepy’s Mattress Stores. So in many cases they owned stores directly across the street from each other. A&G Realty Partners was hired to restructure the leases. They restructured 2,600 leases and rejected approximately 600 others. Gordon Brothers was hired to redeploy and dispose of the inventory in the closed stores. To restructure 3,200 leases is a pretty meaningful accomplishment; the fact that 3,200 leases were restructured/rejected in less than 45 days made it even that more meaningful. It was clear that upon filing on October 5, 2018, Mattress Firm and its team did an exceptional job in coordinating with most, if not all, the stakeholders, including the U.S. Trustee’s office, giving them ample opportunity to assess and comment on the pleading before filing or at least very early on in the filing. The Court and its clerks also were exceptional in being available and handling the case’s substantial issues timely, efficiently, effectively and expertly. The parent of the Debtor was a “Non-U.S.,” entity, so this added another layer of sophistication and complexity to the case, and was/is facing its own restructuring issues. The Debtor’s internal management team seemed very proactive, which isn’t always the case. My client and the Debtor had an approximate $1 million dollar disparity on their claims–my client’s outstanding trade balance. Shortly after the bankruptcy was filed, and in approximately ten day’s time they were able to resolve about 95 percent of the difference. Shipments and payments continued with little interruption. Critical given the timing of Black Friday and the holiday shopping season. Because it is one of the USA’s largest retailers, the sheer volume of stores, constituencies and agendas could have further made it even more overwhelming and more difficult to succeed in the very compressed time frame. As I mentioned previously, when the plan includes a 100 percent payout for most of the constituencies, it certainly makes it easier to move the process along. Accepting the aforementioned and what’s further discussed below, all and probably so much more was accomplished in less than 40 days! 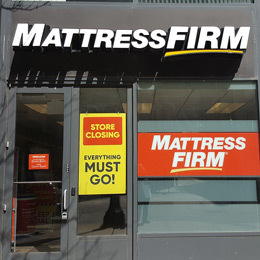 Mattress Firm entered bankruptcy on October 5, 2018 and exited on November 11, 2018. The stakeholders accomplished so much in such a short time and resolved any potential objections, so that they could stand up at confirmation and say, “Your honor we have resolved all claims.”-- a testament to the parties and the potential of the Chapter 11 process. As the cliché goes, nothing good rarely comes cheaply. With over 50 professionals at each hearing, and 50 likely is a conservative number, one can only imagine the cost and this is for a case that given its size seemed to go as smoothly as one could hope. (Again, I was not party to the inter-workings of the case). One could debate and argue for a case that went as smoothly as this one: Why the need for so many people to be involved? On the other hand one could maintain that is why the Company was able to exit in such an efficient and effective manner. Countless times we hear, “It’s not personal, it’s business.” But truth be told, all decisions made in business have some element of “personal” to them. Both good decisions and bad ones effect people and families. And Mattress Firm was no exception. Midway through the case, after its filing and before its successful exit, one of the lead partners at the law firm, Gabriel MacConaill, of Sidley Austin, took his own life. To their credit, my sense is that the irony was not lost on anyone involved in the case. That success can come at a very expensive price. At the beginning of one of the hearings, Judge Sontchi made mention, and I am paraphrasing his Honor, that the legal community pays its respects. Truly, it was a reminder that at is core, the profession is about people. In a day and age where we hear more about the likes of Toys-R-Us and Sears, and a larger number of corporate bankruptcies heading towards 363 sales or liquidations, seeing one of this magnitude engage in restructuring in a more traditional path and achieve ultimate success because of great planning, work and coordination, gives reason for optimism and hope. Robert D. Katz, CTP, CPA, MBA is a Managing Director of EisnerAmper LLP’s Financial Advisory Services group. He is one of the Founders of TMA’s two most successful conferences, The Distressed Investing Conference and the Mid-Atlantic Regional Symposium. He is an Adjunct Professor in Strategic Management and Corporate Finance at Temple University. He can be reached at Robert.Katz@eisneramper.com or (215) 881-8828 to provide additional insight.